A sharp, funny, delightfully unhinged collection of stories set in the dark world of domesticity, American Housewife features murderous ladies who lunch, celebrity treasure hunters, and the best bra fitter south of the Mason-Dixon line. Meet the women of American Housewife: They wear lipstick, pearls, and sunscreen, even when it's cloudy. They casserole. They pinwheel. They pump the salad spinner like it's a CPR dummy. And then they kill a party crasher, carefully stepping around the body to pull cookies out of the oven. These 12 irresistible stories take us from a haunted prewar Manhattan apartment building to the set of a rigged reality television show, from the unique initiation ritual of a book club to the getaway car of a pageant princess on the lam, from the gallery opening of a tinfoil artist to the fitting room of a legendary lingerie shop. 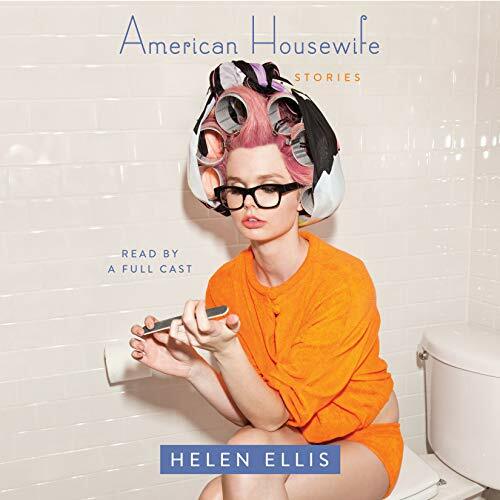 Vicious, fresh, and nutty as a poisoned Goo Goo Cluster, American Housewife is an uproarious, pointed commentary on womanhood. This book was great. I love the humor and truth in some of the stories. I usually do not buy books that are this short. But I'm very happy I did with this one! I actually would recommend reading this in book form rather than audio. Several different odd and sometimes funny stories. Very entertaining. entertaining, but a little shallow. Narration was excellent. Great if you are in the mood for something light. Wonderful beach reading; however, I felt like the writers often turn housewife into a cliché. A few writers did an excellent job of playing with the feminine middle class cliché. The South meets New York City! Absolutely Fabulous! Listen to the whole book while cleaning out my husbands office. Quite apropos ....she only missed one true southern saying. If someone is talking about something you think is completely BS you say: " Well ain't that nice! I really felt that having these short stories read with Southern accents and character quirks made all the difference. Some of these are little gems and are LOL funny. This is a mixed selection; I didn't love every one of the stories, but I recommend this for the humor. some of the stories were entertaining but i struggled to finish this book. i was looking for more tales about the crazy nuances of being a housewife. I heard about this on a podcast and I thought it'd be an interesting look into the life of a housewife. Some of it is funny, but it sort of flounders around aimlessly from story to story, with no explanation of the upcoming ride on the crazy train. The one with the rude neighbor and cats is particularly troubling. At first I had sympathy for the newcomer. Soon I realized the newcomer is insane, and I kept hoping someone would push her down a flight of stairs. Maybe I just had different expectations going into this. While I did enjoy the humor in some of the stories, I didn't feel a connection to any of them. I wonder if this is because these stories are a specific American Housewife (white, upper class, city living). The whole book came off as very vapid, and materialistic. I wish I didn't waste my credit on this book. the reader wasn't grabbing my attention. some of the stories were alright. but others I was just begging to be over. I enjoyed listening to the variety of voices that this audiobook had. The first story was absolutely hilarious, but as the book progressed, I found a few of the other stories to be mediocre. Nice read overall.